Convert your existing bathtub into a step-in shower or bathtub with a door. With the push of a button, safely and effortlessly lower yourself into a warm, soaking bath. Save hundreds of dollars with our discounted Freedom Package™ special! Over $500.00 in savings compared to buying each item separately. 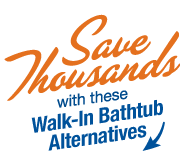 Enjoy the comfort of a warm, soaking bath without having to struggle to get in or out of your tub. Support directly where it's needed, beside a bed, bath, toilet or chair. According to the CDEC, slip and fall accidents in the home and especially in the bathroom are the number one cause of emergency room visits among seniors. Every year more than 11 million senior citizens fall. That's one out of three people older than 65 years of age, usually resulting in a debilitating injury. Many of these accidents can be prevented with simple, inexpensive home modifications. One of our SlipBusters® Certified Aging in Place Specialists will assess your home and determine how to create a safer living environment so you may live safely in your home and continue to Age in Place with the dignity and independence you deserve.